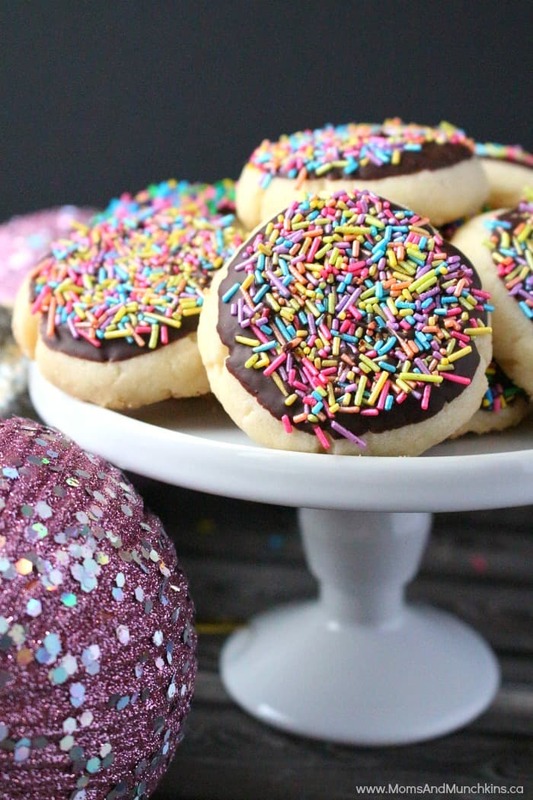 Shortbread cookies are one of the classic recipes my mom makes every year but this year I wanted to mix them up a bit so I dipped them in chocolate and rolled them in sprinkles. The result? Delicious! I’ll never go back to the plain shortbread cookies again! Have you ever made shortbread cookies? They are incredibly easy to make. They do crumble easily so be careful with them when dipping them in the chocolate and sprinkles. Shortbread cookies are perfect for potlucks, baking exchanges, dessert buffets, Christmas baking tins as gifts and more! There are no eggs in these cookies making them a tasty choice for those with egg allergies. Add flour and icing sugar then beat until smooth. Form into 1-inch balls then flatten into cookies (I just use my hands for this rather than digging out a rolling pin). Place cookies on a non-greased cookie sheet and bake for 8-10 minutes. Once the cookies are cool, melt chocolate in microwave (do not heat too much - just heat until still thick but melted). 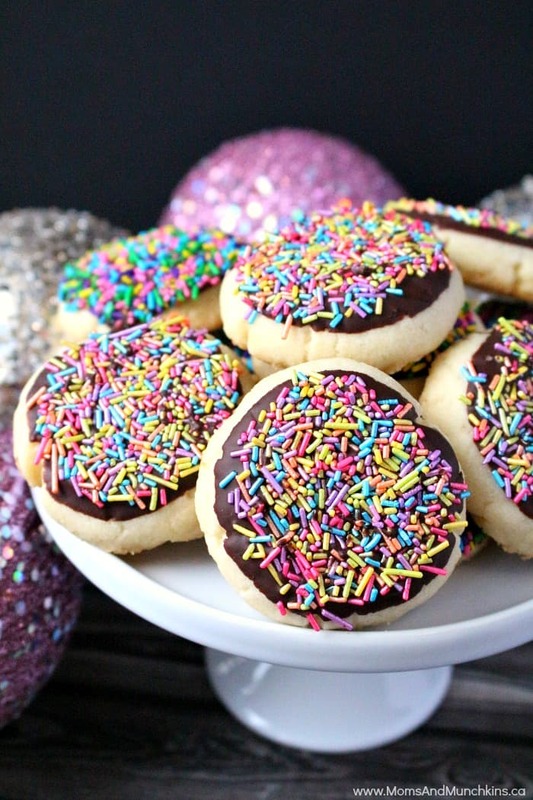 One at a time, dip the cookies halfway into the chocolate and then into the sprinkles. Place on wax paper and continue until all cookies have been dipped. Place cookies (still on the wax paper) in the freezer until the chocolate hardens. Store in plastic container (with lid) in the fridge. For more fun ideas for Christmas including free games, delicious treats, activity ideas and more, visit our Christmas Fun page. We’re always adding new & delicious ideas. Never miss an update by following us on Facebook, Twitter, Pinterest, and Instagram.